Your idea is brewing in your mind. You’re excited and motivated to get it out there, but you need to be careful not to give it away to other people. Our ideas are very much like babies. We need them to grow and flourish, but we need to protect them until they’re stronger. Having said this, you still need to get feedback from many people. How do you do that? The first thing to understand, you should not talk about your big idea with everyone. You need to know why you are talking to someone about your idea. In my opinion, there are three groups of people that you will need to engage, during your idea evaluation. They are a) potential customers, b) potential team members and c) potential investors. Each group is looking for something different and will provide you an insight that other groups cannot. Let’s look at all three and how you can share your idea, without giving the whole of it away to any one group. Please keep in mind that people will need more information but your initial goal is to generate enough interest so that they are willing to sign a non-disclosure agreement or NDA. This blog post talks about that initial stage. 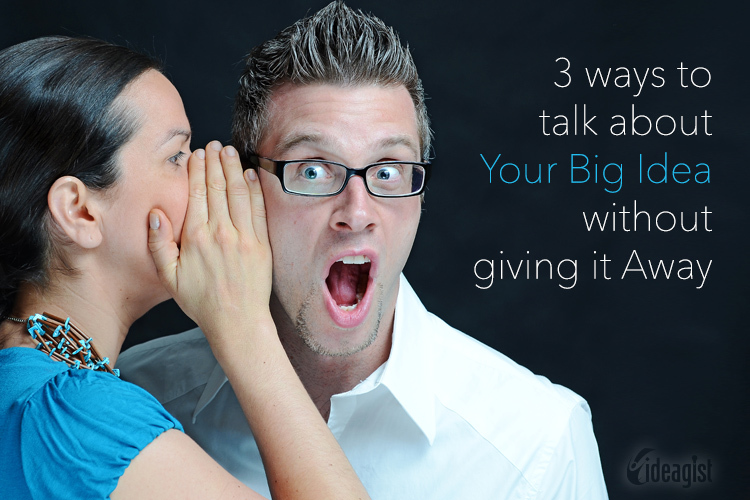 Once they agree to sign the nondisclosure agreement, you can share with them more information. In order for anyone to make a positive buying decision, they must form a connection with what is being sold. Deeper the connection is, more likely it is that they would buy the product. When you are talking about an innovative idea, you are either trying to solve a problem or opening a new opportunity. If you cannot clearly define the problem or the opportunity, your idea is not ready yet. Talk to your potential customers about their pain points. Ask them about their ideas for solutions. Offer a few hints. Ask them questions like, “what if you didn’t have to do that…” or “what do you think about spending a bit more to get rid of this problem?” Gather their information and apply it to your idea. Whenever you call the clinic to talk to your doctor, you always end up talking to the nurse. It is hard to have a middle person. Things may be lost in translation; you need to wait for an answer. Would you pay a small amount if we could connect you directly to the doctor, whenever you had a question? At this stage, if they said yes, tell them that you are working on a great idea to make it happen. Would you like to be one for the first ones to try it out? A yes to this would follow the NDA. While providing details of the problem that you are trying to solve is important, your potential team members would need more. They would need to know your vision. You should provide them with details on the potential financial and social benefits of your idea. From the examples in the previous section, you can talk about easy access to your doctor, for a small premium. You can ask them; would you like to be part of a team that would reduce patient waiting time for millions of phone callers, generating millions in revenue every year while helping people? With the potential team members, you must also share your feedback from the potential customers. It always helpful to show that you have done the homework. If they show interest or ask more questions, now you can ask them to sign a NDA. In order for you to go to an investor and pitch your big idea, you must complete your homework. You would have a single statement in which you would present the problem and potential financial and/or social benefits. You will need to express your confidence in solving the problem and demonstrate your leadership. We are working on a solution that removes the middleman between doctors and patients. Our solution will reduce administrative overheads, manage overall risk for the practitioners while reducing the wait time for patients. We estimate a market potential of $25 million. We are looking for few early stage investors. If the investor is still interested, you can tell them that you have spoken to few customers, you have a team of n people in place and you have started working on our solution. Would they be interested in investing $nnn in our idea? At this stage, if investor asked more questions, it would be prudent to hand them a copy of your NDA. www.ideagist.com offers many tools to get feedback. Join IdeaGist for free.